“I SAVED $15,000 IN REAL ESTATE AGENTS FEES”…. is the typical ‘private’ home sellers marketing mantra and it’s looking set to fuel a bigger grab of the Real Estate sales market! Currently in Australia, private Real Estate sales have little impact on the wider Industry making up just a poultry 1% (5000 sales) of the 500,000 Real Estate sales made annually. It’s therefore no surprise the Real Estate industry doesn’t feel in anyway threatened by home owners ‘going it alone’, but is that naïve as we quickly learn how the internet along with its associated technologies, communication platforms and knowledge base produces new threats and disrupts long held traditional industries with different ways and means of doing business? What we do know is that we have a much smarter and more informed consumer today. We also know a combination of factors have made selling your own home a more attractive and accessible proposition spurred along by a growing number of private sale facilitators cashing in on the ideal and spruiking the mantra. You can also add to that a whopping 34% of home sellers (as surveyed and reported by Core Logic) who had an average to poor experience with their real estate agent. That’s more than one third, and of this, 14% described their experience as either very bad, or disastrous – and there starts the private sellers motivation. And if we wanted some proof as to how those combination of factors can conspire to change the norm, then we only have to look to our cousins in NZ (of which I am one) and parallel their Real Estate industry experience where back in 2011 two independent surveys of potential home sellers both evidenced 36% of respondents that said they would ‘possibly’ try to sell their home privately, with 14% in one survey and 5% in the other saying definitely. Fast forward 5 years and now a significant 10% of NZ property sales are transacted privately. That’s 10 times the rate here in Australia. So why is there still a stubborn popularity of home sellers using Real Estate Agents in Australia? Does a property seller and a buyer really need an agent to connect and mediate the selling of a property? Is finding a buyer really as simple as putting up your own for-sale sign and listing your home on any one of the many internet portals and maybe an advert in your local paper and then waiting for all the buyer enquires, inspections, and the magic to happen. Superficially it’s a range of processes that don’t seem difficult or require great skill, nor is it costly, and that’s the appeal to the ‘do-it-your-selfers’. It’s only when you have the experience or the insight to dig a little under the surface that you can start to see how complex and specialised every aspect of bringing a home seller and buyer together is, in achieving what is our industry’s mandate -‘Selling a Vendors home at the highest possible price’. I can happily say that selling a home isn’t particularly difficult, but evidencing and obtaining the highest possible price requires an enormously greater set of skills and abilities that a private seller just doesn’t have or can conceptualise. ‘This is why there are Real Estate Agents and how they add value to the transaction, to which 99% of home sellers would agree – reluctantly or otherwise. As an example from within our profession, I do know that one prime difference between a good agent and a great agent is their negotiation skills where that difference will account for tens of thousands of dollars more in the successfully negotiated sales price. And that’s not because the ‘good’ agent does a bad job but the great agent truly knows how to get the buyer to pay more and not to quickly allow a vendor to readily accept an offer without making sure there is no more money left in the buyers ‘pocket’! If you were to hand the negotiations between the same buyer and seller to 3 different Real Estate Agents I can almost guarantee you will get a sale concluded at three different prices. Of course, the value added service a Real Estate Agent provides goes much further than skills in negotiating a sale but is equally centred around principle of obtaining the highest possible price for their Vendors home. Advice and guidance on how to present your home can greatly improve your price and reduce your sales time, your marketing strategy and advertising options can affect how much interest you get in your home and of course the more interest the greater the price – especially if using the Auction marketing method, and there really is so much more. Quite simply, if a consumer see’s no added value in your product or service then they will not want nor pay for it. 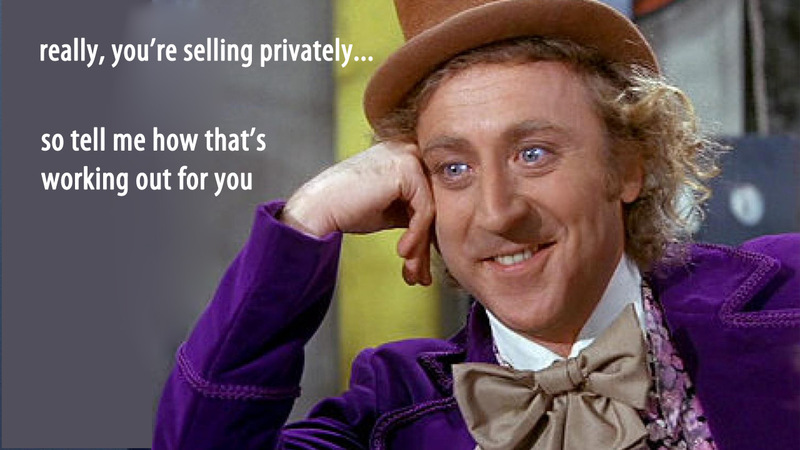 Even as a 28 year veteran in Real Estate, I happily offer private sales advice to potential home sellers where we even a have a private sellers guide on our website at http://www.propertyartists.com.au/selling/selling-tips/ The spin off for us is just goodwill and the influence that can come from establishing those relationships, because in the end its is the strength of our relationships and the quality of our service that fuels the success of our business.